Leading up to Earth Day, I had the idea for my daughter and I to explore some nature in our new home of Los Angeles County! Who knew such a large city would house some pretty amazing gardens? On our first garden trip leading up to Earth Day, we visited Descanso Gardens. This time around, we ventured to Pasadena to Arlington Garden. Arlington Garden was a very different garden experience, but still very fun and quaint, and fantastic with children. If you’re looking to walk around or relax outside without going to a playground, Arlington Garden is a medium sized garden that is free to the public, making it a great place to stop by if you just have a little time for a nature break. There’s always plenty of free parking on the street alongside the garden, too. In one part of Arlington Garden, there are rows of orange trees. Guests are permitted to pick one orange during their visit, something my daughter really loves to do! There are many flowers, little fountains, outdoor art, and shady benches to relax or eat a snack. A couple other parts of the garden that my daughter loves is the spiral rock maze, which she loves to run through. For little kids, they have a tea set and table. 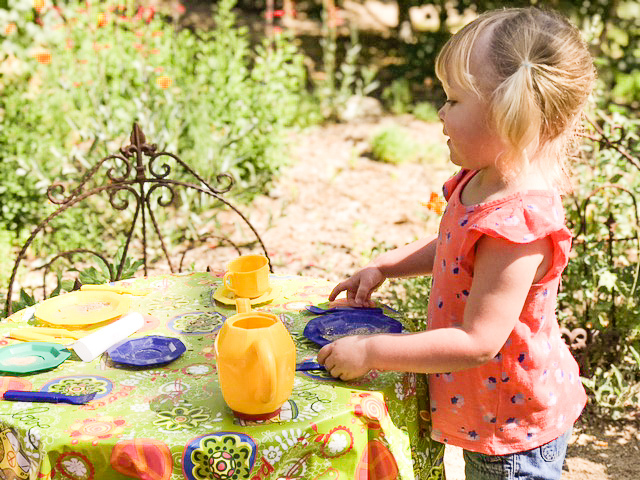 My daughter made friends with another little girl visiting the garden and had a garden tea party (it was absolutely adorable). While you’re exploring Arlington Garden with your little one, you can see squirrels, lizards, and point out all the different colors of flowers throughout the full, lush garden. To learn more about this beautiful outdoor space in Los Angeles, visit their site here. Happy Earth day, and happy exploring! Going with kids: Stroller friendly, great with kids!